What’s to know about Wisdom? In AD&D Wisdom seems pretty straight forward with little room for confusion – or IS there? It might be time to take a closer look. Previously we have taken a closer look at Strength and Intelligence, now it’s time to look into Wisdom and how the Fail Squad Gamers have often misused it, house ruled it or glazed over it. For this we look to the AD&D Players Handbook (1e Easley Cover) page 11. The general description of Wisdom is pretty straight forward. It’s a composite term for the character’s enlightenment, judgement, wile, will power, and (to a certain extent) intuitiveness. That’s pretty plain. Clerics with a 16 or higher get a 10% XP bonus – well we all know that. At 5 or lower wisdom a character can ONLY be a thief. This means no completely oblivious wizards or warriors. However, I don’t understand this ruling other than it must have a game mechanic effect elsewhere. In my mind, a thief would need a bit of intuition to know when someone is watching, when it’s safe to sneak through the alley, or if you might get caught picking a pocket. I would like to have debated this with Gary Gygax a little. At 14 we reach the maximum wisdom possible for a Half-Orc character. It is also the Minimum wisdom required for a Ranger. This means it’s an extremely rare half-orc that makes the lower cut for the worst of the Rangers. Here we have a game limit, that there can be no half-orc monk player characters. 17 is the Maximum wisdom for a halfling, and the minimum required to cast 6th level clerical spells. Here is where our group went COMPLETELY off the tracks with wisdom and did a terrible disservice to this rule for a very long time. With a Wisdom of 8 or less you have a penalty and 15 or more you have bonuses to saving throws for all characters. We would simply pop in the bonus on our saves and move on. That is NOT how this was supposed to work! Below the table is an asterisked note that details the bonuses and penalties ONLY apply to mental attack forms involving will force. Beguiling, charm, fear, hypnosis, illusion, magic jar, possession, telepathic attack etc. It is not an open bonus or penalty to all saving throws! 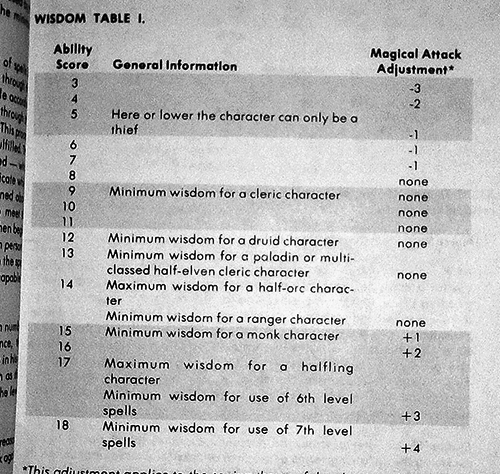 This table we did use more appropriately but we didn’t spend a lot of time considering the lower wisdom clerics and their penchant for botching spells. Below a 12 wisdom, there is a real chance for spells failing. Something I never took into account as a DM when the nutty Kobold Shaman came around. At a 9 wisdom, there is a 20% chance that spells will fail and do nothing at all. This is the part players always were focused on, and it is exactly as we dreamed, bonus spells that stack up with higher wisdoms. Does this unbalance the game? I think no. Clerics have the burden of being the “Healing battery” of the party. without these bonus spells, playing a cleric would be a drudgery of just casting Cure Light wounds and turning undead with little else to do. These bonus spells give the cleric a chance to heal their comrades a little AND cast the more interesting spells. Clerics and this problem of always having to be the healing battery was always at the forefront of one of our problems with the game. No one wanted to be the cleric, but we all knew we needed one. Most of this was due to the constant doling out of cure spells, which ate up spells prayed for for the day. Pretty quickly, we ruled that a cleric could swap out any spell for a Cure Light Wounds spell at any time. 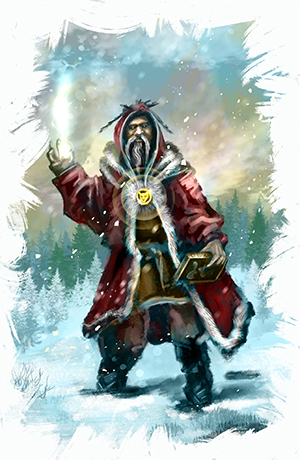 We tinkered with variations on this to make clerics more appealing to players at the table. We eventually came to a system of casting spells as they seemed appropriate at the time without praying ahead. Then when 5E released, I nearly cheered with joy when I saw Spell slots! This was what we had been working toward all this time. Spell slots may even get plopped into our 1E mash-up game. I daresay it is the BEST thing about 5E rules! How have you dealt with Wisdom? Were you failing at it as terribly as we were? ← Do you make these mistakes with Intelligence?